Ho Ho Ho! It’s time to get Festive on the blog! It’s my favourite time of year so I can’t WAIT to start the festivities but I always hold off until after my birthday (Nov 24th) before getting too excited for Christmas. For my first festive post, I thought I’d give you a few ideas for things to add to YOUR Wish List. 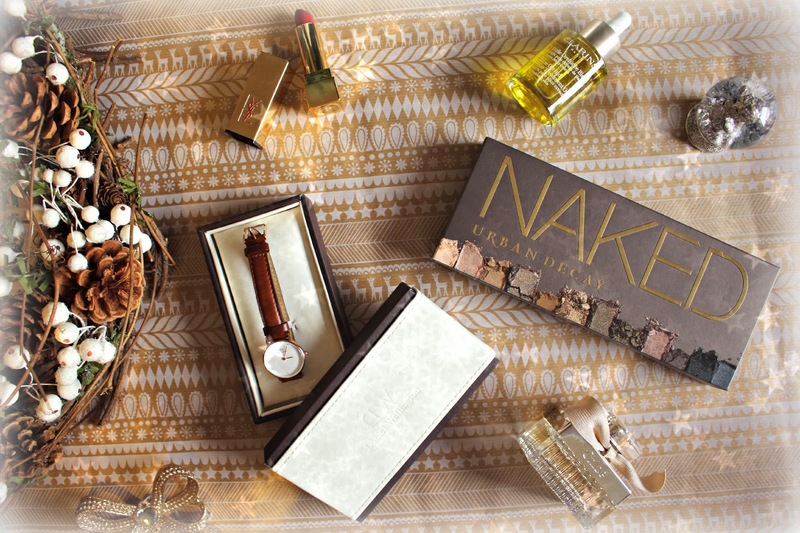 My top 5 recommendations include YSL Rouge Pur Couture Matte Lipstick in the most Christmassy of reds, the ultimate luxury facial oil – Blue Orchid Face Treatment Oil from Clarins, the Urban Decay Naked 1 palette, a dainty bottle of Chloe Fragrance, and the watch on everyone’s wish list; Daniel Wellington. Firstly, the Yves Saint Laurent lipstick is the ultimate gift to receive in your stocking – wrapped up it will look so tiny and unassuming, but when you open it to see the decadent gold casing, and find this most festive shade inside, you’ll not want to wear anything else on your lips over the Christmas period. I’ve chosen shade 104, a deep red which will suit all skin tones. Available here. Another luxury product which you may have been curious about, but not quite ready to splash the cash on, is the Clarins Blue Orchid Face Treatment Oil. The beauty world has finally accepted oils (even for gals with oily skin) as a staple part of the beauty routine and this Clarins oil is a winter skin essential – the pure plant extracts revitalise and restore radiance to your skin and hazelnut oil prevents moisture loss and the formation of fine lines. The fragrance as well as absolutely divine and the texture is light enough to apply every morning and it absorbs quickly allowing you to apply makeup soon afterwards. Available here. The next product to add to your wish list isn’t even a luxury, oh no. It’s an essential. You’ve read millions of reviews on the Urban Decay Naked palettes (including mine, here!) so you know just how fabulous they are, and how much use you will get out of this palette. The only tough choice is which one to get. I’ve chosen the original for my Wish List post – it’s chocolate velvet case emblazoned with NAKED in gold foiling is just the ultimate in luxury palettes, and the 12 shades within range from delicate champagnes, to dark gunmetal and everything in between. Available here. Another Christmas essential is always a bottle of fragrance – this year don’t leave it to chance – make sure you ask for the one you want! I’ve never met anyone who doesn’t love the Chloe Eau De Parfum – the bottle is beautiful with a hand tied ribbon and silver plating, and the rose scent is a favourite fragrance of the feminine and the chic. It’s delicate, but long lasting and can be worn at any time of year, day or night – a truly multi-use fragrance! Available here. Last, but most definitely not least, and let’s not pretend you didn’t know it was coming! The Daniel Wellington watches have taken the Instagram world by storm, and how could they not? They are SO pretty! Whether you go for the ‘Classic’ large face with it’s delicate rose gold detailing, or the slightly smaller ‘Classy‘ style, the face of which is slightly smaller, and the number are replaced by Swarovski Crystals. The Classy style is perfect if you have slightly smaller wrists like me, or prefer a more delicate accessory. 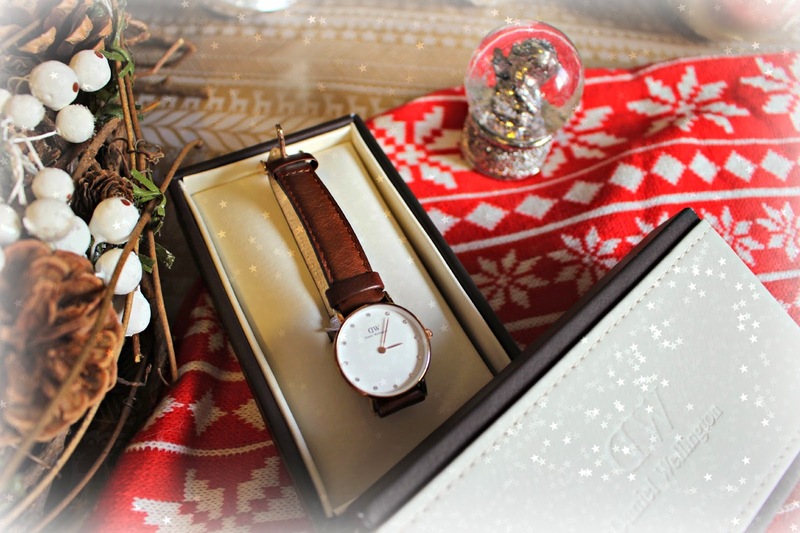 Father Christmas will be pleased to hear that you can get a 15% discount plus free worldwide shipping on everything on the Daniel Wellington website using the code holidayfashionm, which is valid until Dec 31st on www.DanielWellington.com. Previous Post Black (Eyeliner) Friday!